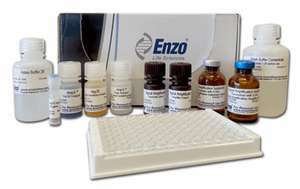 Figure: Amp'd™ HSP70 High Sensitivity ELISA Kit from Enzo Life Sciences, Inc. Strengthening our leadership position in heat shock and stress related products, Enzo Life Sciences now offers Amp'd™ HSP70 High Sensitivity ELISA Kit – the most sensitive ELISA for Hsp70 detection. This kit enables detection of both baseline and upregulated levels of Hsp70 (Hsp72) and relies on small amounts of starting sample. Hsp70, a major molecular chaperone and large heat shock protein, plays a role in cell stress regulation, folding/re-folding of substrate proteins, preventing aggregation, and many other proteostasis related functions. Aberrant Hsp expression is linked to several pathological conditions and diseases such as neurodegenerative diseases, inflammatory conditions, infectious diseases, and cancer. In cancer, Hsp70 is a key biomarker functioning in a cytoprotective role where its overexpression leads to enhanced cell transformation and tumor resistance likely due to its anti-apoptotic effects. Baseline levels (<20 pg/ml) of Hsp70, specifically the inducible form Hsp72, have been traditionally difficult to detect using current ELISAs. The Amp'd™ HSP70 High Sensitivity ELISA Kit has greatly improved sensitivity enabling detection of both baseline and upregulated/stressed level of Hsp70 (Hsp72). This increase in sensitivity allows less sample needed to obtain accurate quantification of very low levels of Hsp70 (Hsp72) concentrations. The Amp'd™ HSP70 High Sensitivity ELISA Kit can be used to quantify human, mouse and rat Hsp70 (Hsp72) in serum and plasma samples. This ultra-sensitive assay is fully quantitative, with the ability to detect as low as 7pg/ml of Hsp70 (Hsp72), surpassing semi-quantitative Western blot analysis and current ELISA detection. Negligible reactivity is detected of similar Hsp70 family members (Hsc70/Hsp73, Grp78, DnaK, or Hsp71), and assay results are obtained in 4.5 hours for up to 38 samples in duplicate.